No God but God by Reza Aslan was an excellent book on Islam which presented Islamic history to a non-Muslim audience as well as served as a refresher course for most of us Muslims too. It was astutely written if with a Shia slant, so you come to Zealot knowing that it too has Aslan’s interpretation of a historical Jesus. It isn’t exactly an academic piece of writing, (for that there are many other writers) though it draws from some of his own research. At some thousands years after Jesus’s death, what Aslan presents is not new in that sense, though he presents it in a creative manner that at the heart of it, for me at least, was about understanding the divergence between Judaism and Christianity. He uses his strengths – a breathless, cinematic style to show off his creative writing chops that really sketch a vivid picture of life in the time of elite Herodian Romans, the influential Temple priests and by contrast the suffering salt-of-the-earth peasantry and lower classes. His interpretation portrays Jesus as an angry young man smashing temple artifacts, and espousing the zealot ideology of protest and revolt against the State. Aslan chose to focus on this one aspect of Jesus and little on his compassion, and spiritual teachings. So in opposing the Roman overlords, the Temple priests, and the wealthy Jewish aristocracy, he was priming for a revolution. One that, as we know, didn’t quite end as he planned. While this narrative fits in neatly with the discontent among the proletariat around the world, and tows Aslan’s main line of inquiry – into the Zealots of the time, he runs into some conflicting quoting of the gospels to suit his theory. Despite that, it is still an engaging piece of work. The semantics that he draws on to explain ‘the son of man’ and of ‘son of God’ is actually very fascinating and makes you wonder there was a literalistic tendency to take this understanding as the Gospel truth, if you will. 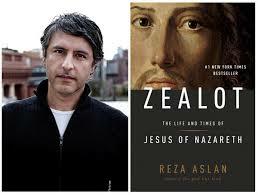 If anyone can make religion interesting and keep you turning the pages, Reza Aslan is your man. His might not be the final word into your inquiry but certainly is a good starting point.